I’ve teamed up with a fabulous group of bloggers to offer up a pretty sweet summer giveaway! 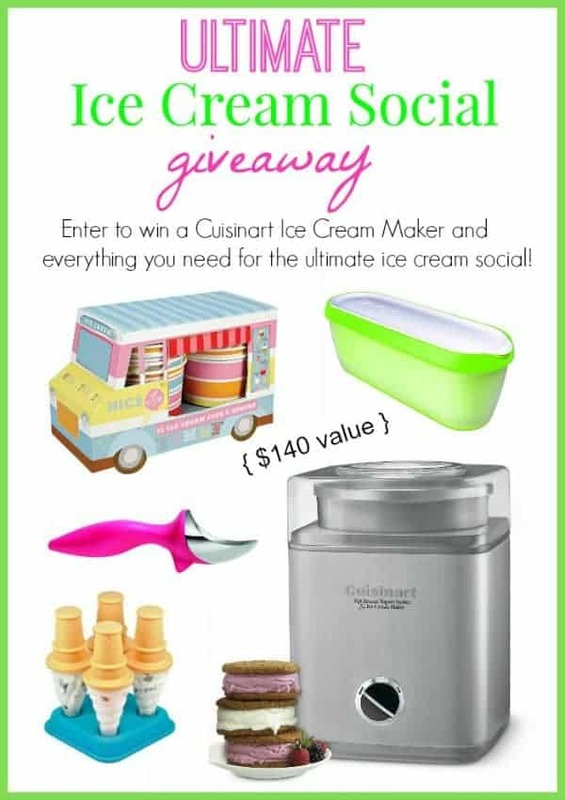 Enter to win the Ultimate Ice Cream Social prize pack to keep cool this summer. Due to Amazon.com shipping restrictions, a Canadian winner will receive a choice of $140 Paypal Cash or Amazon GC. As long as it has chocolate in it, I’m good to go. I would have plain vanilla with hot fudge and whip cream. I’m pretty plain when it comes to the ice cream part……vanilla, but give me lots of topping choices from fresh fruit to tummies and smarties and everything in between. My kids would wear this out! Caramel sauce is my fave! mmm I could eat it from the jar! Also chocolate chips, skor bits, and reese’s pieces make good toppings! Can’t forget the whipped cream and marashino cherries! The toppings would include strawberries, blueberries, chocolate sprinkles, loads of whipped cream, slivered almonds. I would have chocolate, vanilla and strawberry ice cream with chocolate syrup, nuts, and whipped cream toppings. I will have strawberry ice cream with vanilla wafers crumbled on top and whipped cream. i love vanilla ice cream with peanut butter topping, reeses and whipped cream. I love chocolate and fruit in my ice cream. Toppings – sprinkles, whipped cream, Hard shell chocolate, walnuts in syrup and fresh fruit. I would have to have Reese’s or fudge and pistachios as possible toppings at my ice cream social! chocolate ice cream, hot fudge, strawberry ice cream & strawberries, coconut, whipped cream, chopped nuts & sprinkles for the little kids. NO bannanas- I do not like them! Vanilla chocolate, sprinkles, gummyworms, caramel, nuts the whole 9 yards! My k7ds would be thrilled!! Chocolate is definitely my favorite, but I love strawberry too! Fresh fruit and nuts are wonderful toppings. vanilla, chocolate and strawberry ice cream, with oreo, butterscotch, fudge and m&m toppings!! I would have vanilla ice cream with the following toppings- strawberries, chocolate, bananas, coconut, blueberries, nuts, whipped cream, cherries, & sprinkles! Vanilla, cookie dough, strawberry, chocolate, hot fudge, caramel, sprinkles! I like vanilla or strawberry ice cream personally but love to add toppings like sprinkles, whipped cream and lots of maraschino cherries! Occasionally some chocolate syrup too. Oh man, I would be trying all different kinds of ice cream! Definitely butterscotch and caramel toppings… Strawberry and vanilla! Oreo crumbs… Sprinkles… So much! Vanilla and strawberry ice cream and chocolate topping. chocolate icecream, with chocolate sauce, whipped cream, and a cherry on top. What a great summer giveaway! Both chocolate and strawberry ice cream (which are my little gal’s fav’s!) and hot fudge. Maybe some whipped cream and a few walnuts. Yum! Chocolate, Reeses, and whipped cream. All for me. Who says I have to be social? Strawberry, chocolate, carmel, cookie, nuts, pineapple, peach and everything else I can think of. I love ice cream! Chocolate, hot chocolate, chocolate cookie pieces….sensing a theme?? Chocolate, vanilla, mint choloate chip, fudge, caramel, heath bar crunch, cookies and cream! Sprinkles. strawberries. blueberries & vanilla ice cream & cookie crumbles. I would have vanilla, chocolate, mint chocolate chip and coffee. Lots of yummy toppings including sprinkles, reeses, oreos, chocolate chips, and yummy berries. What a great giveaway. Caramel and chocolate. Yum!! Waffle cones, sprinkles, chocolate chips, ice cream, syrup and smarties.